" SOLD! To the man in the blue shirt..."
auction prior to bidding on any item. the Bidder's responsibility to determine condition, age, genuineness, value or any other determinative factor. warranty of merchantability or fitness for a particular purpose. Bidder shall be the sole judge of value. may not return any item they purchase. buyer's premium and any applicable taxes. Buyers will be charged a second time for any purchases that are shipped. 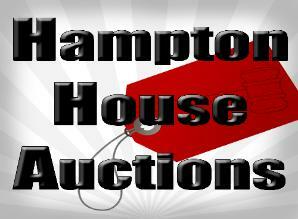 with correct amount including change if they contact Hampton House Auctions prior to their credit card being charged. Buyers agree to waive any and all rights to initiate a credit card charge back against the transaction and/or the seller. residents will be charged 6% sales tax unless we have your tax number on file. and I were hooked and we still laugh about it. CALL US IF YOU HAVE AN ESTATE YOU NEED HELP TO FINALIZE. WE ALSO ACCEPT CONSIGNMENTS, MOVING SALES & LIQUIDATIONS. FURNITURE or OVER SIZED ITEMS. be between 11-6 pm at our warehouse location ONLY. Holding fee of $5.00 on the registered credit card on file. 5 day grace period until item is forfeited or resold. We do not have the space to hold furniture for you. or oversized items for you from an ON SITE pick up, only smalls. and re-auctioned. Any moneys received on those items will be applied to storage fees. deemed forfeited or resold by Hampton House Auctions. the scheduled pick up day. ups. All fees and terms will apply. You can call us at 864-901-9598 or 864-320-3618 with any questions or concerns.